A bill to legalize abortion narrowly failed in the Argentinian Senate. But feminist movements have already effected a social revolution in South America. On August 8 the Argentine Senate, by a narrow margin, voted down the Law of Voluntary Pregnancy Interruption (IVE), which would have legalized abortion in the country. The Catholic Church rejoiced, having led a ruthless campaign against safe and legal abortion for women. Several political operatives, from bourgeois politicians to trade union leaders, had caved in to this intense anti-abortion rhetoric. This for two reasons: one, their general capitulation to the ideology of “family values” upheld by both neoliberal forces and the Church; two, because they were terrified of a new social force that had arisen in response to neoliberal predation and was now decisively shaping the political terrain: the feminist movement. The Argentinian feminist wave galvanized around the Ni Una Menos (“not one less”) movement, which arose in 2015 to protest the murder of fourteen-year-old Chiara Páez. The movement began as a struggle against femicide but rapidly radicalized, expanding the ambit of “violence” as an analytical category to include the multifarious assaults of capitalism on the lives of poor and working women and gender non-conforming people. It was the political breadth and activity of Ni Una Menos and of the Polish feminist movement that provided the inspiration for the International Women’s Strike. CA What is your response to the Senate vote, which narrowly failed to legalize abortion in Argentina? What are the next steps for feminists? LC, VG Our response is fury and euphoria. Fury because the Senate’s rejection means a decision to ignore women’s power. It is a familiar scene: this moribund political elite pretends that our efforts are invisible, as if they don’t count. This attitude echoes their lack of recognition of our work, of the ways we produce value, of our ways of building community. The Senate’s rejection dramatizes their contempt but it is also an attempt to discipline us. Here, the principal actor is not the Senate, but the Catholic Church, led by the (Argentinian) Pope. 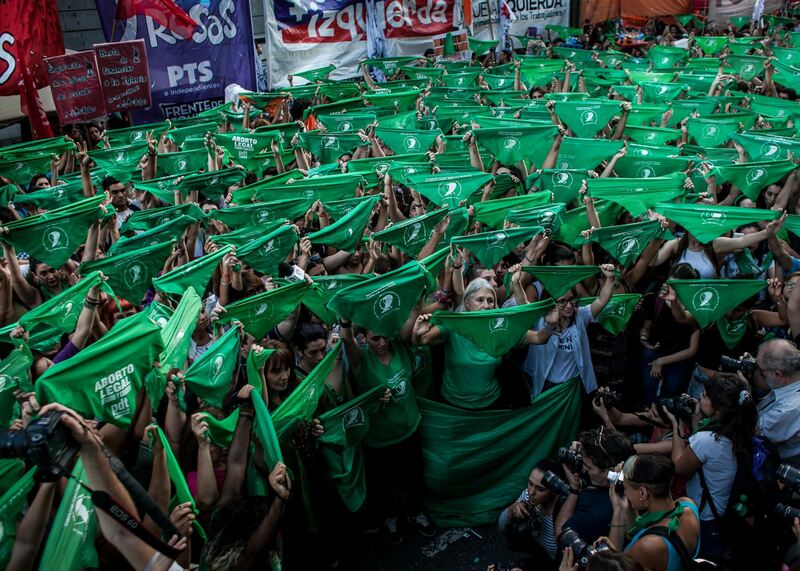 In Argentina, the battle for women’s bodily autonomy is crucial because the abortion debate is part of a radical, mass feminist movement and it is now a debate about class in terms of differentiated possibilities for accessing safe abortion. As we argued before the lower house vote, for the Church, the right to decide must be kept away from popular neighborhoods. This entry was posted on Tuesday, September 11th, 2018 at 00:05	and is filed under Uncategorized. You can follow any responses to this entry through the RSS 2.0 feed. Both comments and pings are currently closed.